Yesterday we had Gomesa crispa from the Mata Atlantica forests of Eastern Brazil and here is another from the same region. 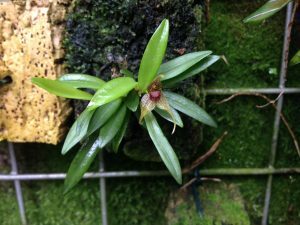 Dryadella edwallii is a miniature orchid previosly included in Masdevallia. It is an epiphyte found in humid gullies amongst ridges at around 1300m where it will experience low light levels and constant damp surrounded by mosses and ferns. To replicate these natural conditions we grow the species mounted (we find all tiny miniatures do best and look best mounted) on bare cork bark hanging on a north facing wall in Cool Americas where it never gets direct sunshine . We spray it daily with rain water and add a low concentration of feed (300-400 microseimens) in every other watering tank. The flowers are long lasting and relatively large for the plant that has leaves just 3cm long.